I’ve seen every episode of the original Beverly Hills 90210. 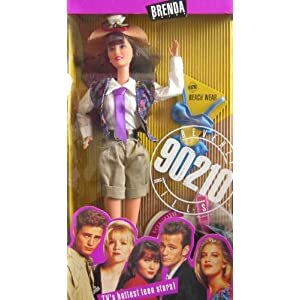 I had (I believe it’s still in my parents’ basement) the Shannon Doherty/Brenda and Luke Perry/Dylan Barbie dolls as a child. I dreamed, my entire life, of looking (and dressing) like the girls of Beverly Hills 90210. Here’s Brenda Walsh lounging on the beach with the sexiest man alive…ever….in a chunky knit sweater. I’ve sat around for the last few years cursing you ladies who can tuck your skinny jeans into riding boots. My darn calves just won’t accomodate this trend. So I’m delighted to see the runways this year in favor of skinny jeans with short boots! Again, here’s my favorite Miss Brenda Walsh rocking a pair of black boots and skinnies from back in the 90210 days. Kelly and Donna are rocking a fab traditional 90210 trend – flowy floral. So go ahead, Career Girls! Rock that 90210 throwback. I know I am!